How is it we crave food we’ve never even tasted? I’ve never been to Chicago and I’ve never eaten one of their hot dogs, but I knew I had to have one. There are many hot dog purists out there and lots of opinions on how hot dogs should be served and constructed. I say, if you like it, then that’s the way to serve it. People love to connect over simple foods like this and who doesn’t love a hot dog at the ball park during the summertime? I had to try a Chicago-style dog because I wanted to taste the sweetness of the relish with the sourness of the peppers and the sprinkle of celery salt that is supposed to bring all the flavors together. So yesterday we braved the cold and the snow and fired up the grill. While Chicago dogs are usually steamed or boiled we wanted a char-dog. We were not disappointed. Hot dogs have always been a part of American culture and they have been a way to express regional style and preferences all across the United States. These were fantastic by the way, The sweet, the sour….we loved them. Many Chicago dogs also have dill pickle spears, add them if you want. We were very happy with these. What’s your favorite way to serve a hot dog? Cut each tomato crosswise into 1/4″ slices. Prepare remaining toppings. Place a grilled dog in each bun. Tuck 2-3 tomato slices between each hot dog and bun. Add two peppers, one on each side of each hot dog. 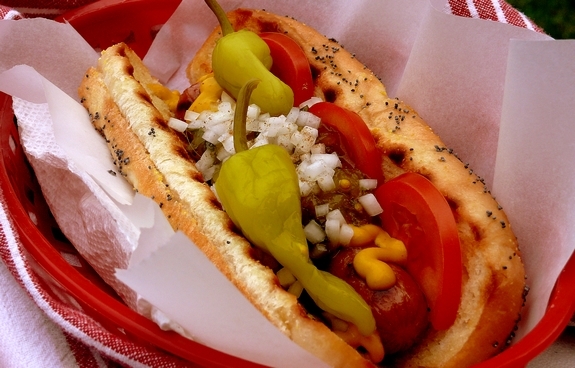 Spread a generous amount of mustard on top and scatter about 1 Tablespoon of onion and pickle relish over each hot dog. Finish with a generous amount of celery salt. I usually make mine with dill relish, chopped sweet onion, and Dijon mustard. But I have recently discovered Bubbie’s Kosher Dills, which have a sweet and spicy flavor, and I think I want to try a hot dog with them and a coarse country-style grainy mustard. No toasting…you guys are missing out! I love first hot dog that has been grilled, next chili with no beans, coleslaw and the and a sprinkling of cayenne on a steamed white hot dog bun. Love your blog and your wine!! I am hoping our local liquor stores will carry it very soon! I was so pleased to see you didn’t put ketchup on the hot dog. You know that’s a mortal sin right? hehe! well, why don’t you come to Chicago? bring some wine? haha! I do like Chicago hot dogs… didn’t know what to expect when I moved here but very good! nice!!! yes! did it it just right Cath! I’ve always lived in Arizona but last year I moved a few hours south to Tucson which apparently is known for their “sonoran dogs”. A hot dog wrapped in bacon and grilled then served in a steamed bun and topped with pinto beans, tomatoes, onions, jalapeno sauce, mayonnaise, and mustard. YOu can then add a whole bunch of other toppings like queso fresca, pickled onions, avocado, pico de gallo, cucumbers… It’s a pretty epic dog! I’m from Chicago, and I agree with you, even though I could be ostracized for making this public – toast the bun. I must, however, insist on the neon green relish. Yeah, I don’t care what the “rules” are. Your hot dog looks super delish! It is weird how some people get so worked up over how to serve a hot dog. I’ve never had a Chicago hot dog. I have made a few visits to Chicago, but never really spent much time enjoying the traditional Chicago foods such as deep dish pizza, Chicago hot dogs, or Italian beef. I have not eaten at old institutions like Ed Debevic’s, or new ones like the Cupcake Gallery. I’m always with my BIL and his family and they’re into uppity food. My favorite way to eat a dog though is pure NY. I like it with mustard adn sauerkraut or else with the red onions in tomato sauce. I absolutely love sport peppers with my dogs! But I admit, I’d probably ruin the Chicago Dog part and add a bit of mayo. I’ve never been to Chicago, never had a Chicago style dog. I’d love to have one of these right now. Isn’t a good hot dog just the best? Having been born and raised in Chicago, I’d say you got it spot on! I love the fact that you’ve included the little details, like the poppyseed bun.